Pitchers and catchers. To those who love baseball, just hearing those two words paired together is like a balmy July breeze blowing away the February blues. For a moment, there is no serious financial crisis. Global warming merely seems like a chance to play baseball longer. The guns and bombs in Iraq and Afghanistan fall silent. You’re ten-years old again, playing catch in the backyard with your dad. For just a moment, all is right with the world. February 15th is the date when the magic begins again with Twins pitchers and catchers reporting for spring training in Ft. Myers, Florida. Position players report on February 20th. The first spring training game against the rival cross-town Red Sox is on February 25th at the Twins park. If you haven’t been to a Twins spring training game, it’s a time-honored rite you really should experience at least once in your lifetime. 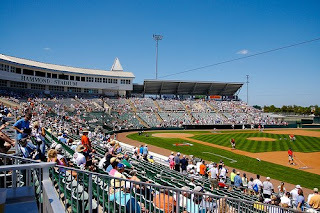 The Twins play their spring training games at beautiful Hammond Stadium in the Lee County Sports Complex. It’s a sweet, little ballpark that seats about 8,000 comfortably. This park couldn’t be less like the Dumpy Dome back in the Twin Cities. Real, green grass pushes up toward the sensuous Florida sun. Every seat is a good seat. Tall palms sway in the Gulf breezes. A long home run could end up on the highway or in the Florida-style office complex just beyond the outfield fences. Not far beyond the park’s perimeter, beautiful, Bikini-clad women stroll in the surf on the famous beaches of Ft. Myers. Being at spring training is a great time to see some of the young players from AA and AAA you hear about, but who may not make it up to the big leagues this season. It’s a chance to gauge the quality of the team the Twins will put on the field in April. Somehow, the hot dogs and brats also taste better when washed down by a premium beer under the warm March sun, out in the fresh air--just like baseball is supposed to be. One of the more surprising discoveries is how international and national an audience any spring training game will attract. When you go to a Twins game at the Metrodome, you’re surrounded by mostly Twins fans and some fans of the opposing team. But at a spring training game, you could be sitting next to fans from Australia, Japan, Canada or even Europe. Or it could be a Tigers fan, Cubs fan, Reds fan or Mets rooter without a connection to the team the Twins are playing that day. Fort Myers baseball fans are a reflection of the international tourism destination that is southwest Florida. Even more--for a Minnesotan--coming to Twins spring training in Ft. Myers is the ultimate cure for cabin fever. You’ll have firsthand experience of one of sports most timeless and cherished rituals. When you return back home, you can look forward to spring actually being just around the corner.